Needless to say, there is no note on the story to show the correction. The BBC have got themselves into a right pickle, ever since they decided to effectively ban comments from sceptics. Instead they are happy to quote any climate loon, as long as he has the right credentials. ← New February Temperature Record At Kew–But Is It Evidence Of Climate Change? 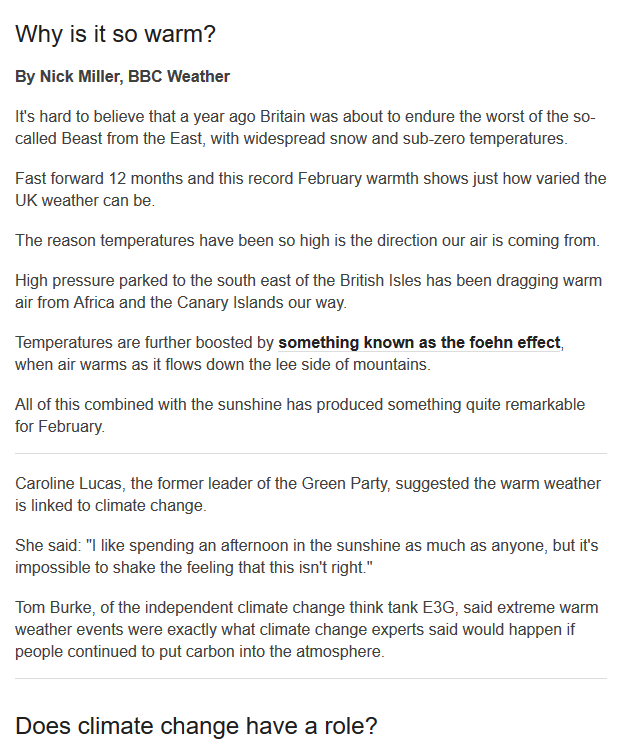 The BBC ought to be obligated to state what corrections it makes, especially to ‘climate/weather’ related stories. they are happy to quote any climate loon, as long as he has the right credentials. 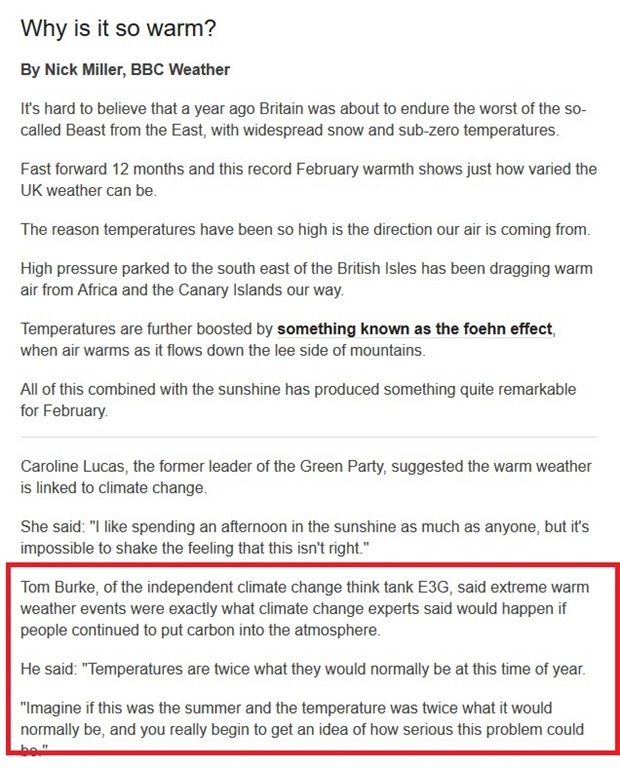 What staggers me about Tom Burke’s statement (which was strictly correct when he made reference to a temperature record – the Met & BBC have used the Centigrade scale as standard for many years) is that hardly anyone, apart from Paul, has picked up the difference between one isolated reading on an exceptionally warm day and a common (but variable!) 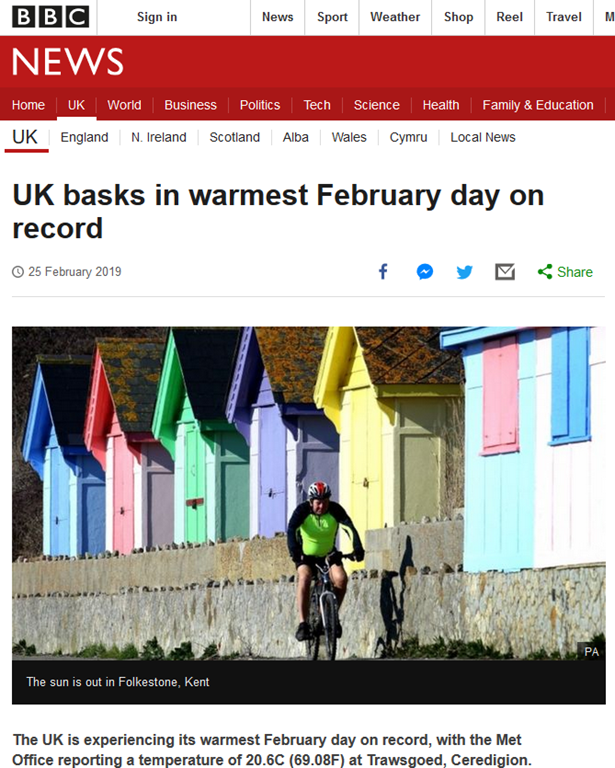 AVERAGE in the UK for the month of February. Instead, some are equally as guilty of obfuscation with references to Absolute Temperature scales, etc. It’s not “strictly correct” in any way. The centigrade scale does not start at zero. The idea that the “normal” is “ten” is utter nonsense, it is a scale, not an absolute, that’s why it’s called a scale. But yes, the comparison between a record and an average is egregious. Phoenix, ” The centigrade scale does not start at zero.” and ” that’s why it’s called a scale.” is a nonsense of which an AGW/CC proponent would be proud! No one bandying around BS like that has the right credentials. Well I was going to ask: what ARE the right credentials? It’s the old trick of using a non-zero base line to exaggerate an effect. In this case, we’re talking about a temperature of 20 C compared with a norm of 10 C ie 290 K compared with 280K or an increase 3.57%. Hardly headline grabbing and certainly not a doubling! This time last year, we were coping with “the Beast from the East” when UK temperatures fell to minus 6 C or 264 K, a reduction from the norm of 2.2%. Somehow, the alarmists still managed to blame that on climate change. Laughable though it is, all this guff does affect political thought and therefore public policy, and so affects us all in the wallet. When are these liars and charlatans going to be called out and sued in the courts? It’s already happening in the USA with Michael E Mann unsuccessfully attempting to sue Mark Steyn, Prof Tim Ball and others. We need the same kind of high profile law suits here in the UK to raise awareness that AGW is a scam and to begin to shift public opinion. I think we may all agree it is difficult to get through to the average person the measured, pragmatic approach taken by this website and its users to the whole energy/climate topic. I have of late thought that this mentality ought be considered the sensible middle ground and those who purport climate breakdown, zero emission theory and renewable fantasies as the “extreme” viewpoint. I would propose that these be called out as extremists(for that is what they truly are-albeit some may not realise it so) and that this may help reverse the preconceived notion of many. He appears to basically be a self-appointed busybody who undoubtedly knows best, but apparently doesn’t understand the very basics of measuring a temperature and what it means. Between Science and Technology aka a form of education, I always get so annoyed when the educated Media harp on about things like Centigrade when it should now be Celsius, call kilometres ” kill-ometers, and relate volumes of water to swimming pools etc …. you know what I am getting at. just a load of bulkshit to fill Copy! As a youngster, we were encouraged to Read and Listen to the Radio to improve our command of the Queen’s English. So what do we get nowadays? …. This does NOT promote good understandings of Sc. & Tech. Sadly Many European TV Stations adopt BBC Progs ( eg Blu Planet) as Gospel and it really is a Cancer on society – that any discussion has to include the reference to Clim Change / Glob Warming, Just like someone who “flipped” yesterday ( On Jer Vine Prog ? ) about using words and phrases as “Absolutely” where not much thought was given to what they were saying ….. Indeed yes! I meant to add – That Scientifically, Temperatures should be mentioned in Kelvin ( Absolute) which would be a self serving check on correction. Everyday folk talk about Degrees C … and OK from 10C to 20 C, the temp HAS doubled …. the hockeystick lot like this don’t they? To be sure, the number doubled. …and what about almost anyone who is interviewed on radio or TV, these days, starting his/her reply to almost any question about almost anything with the meaningless word “so”?? PS Tom Burke’s twitter feed has his claims all over it still, if people want to leave comments on that! I think I’ll stick to Fahrenheit – only a 40% increase above “normal” this month, so no doubling then. E3G “independent”??? Ha! Pull the other one! Just a reminder that here in the Pacific North West we’ve had the coldest January and February that I’ve experienced in the past 15 years and no end in sight. So much vegetation has been knocked for six, it will be a boon year for garden centres. Worst winter here in the southeast U.S. in a decade. Cold not so severe, but extremely wet. When they say ‘climate change,’ demand a definition. Nothing at all to do with ’emissions’. Confirmation-bias types take note. I can remember when everyone LOVED a warm day in February.